Where do you get palys that big? Those must be, what? Like 8" across? I don't know BK It seems to me to me that its just a juvenile hippo next to some Protopalythoa grandis, this species polyps can reach up to 2'' in diameter. no way any palys get as big as a hippo tang. that's just crazy talk. How do you know it's only 6.6 gal? It looks a lot bigger than that. That also has to be the smallest tang I have ever seen as well. In 6 months it will eat the whole kitchen. Okay, a quick video of that tang in that tank would totally settle this. Bonsai, get back in touch with your Flickr buddy and get him to do so. I will be the first to eat a live crow on Youtube if he does this*. *Offer not really valid since I'm a vegetarian. I thought i did state a juvenile. You never seen a 2''Tang? I think it's just sarcasm on the no tangs exist under 2" If it's not you guys are retarded. Ok... I found what you were talking about on page 13.....lol I haven't read the thread in awhile. unlike the guy who photoshopped this tank. dude's got mad skills. I'm new and this thread is not but after wasting 30min reading the whole thing I want to add something so the next chap who reads this will have to waste more time than i did. I really hope the debate over the tang size is a joke, if not you people who think a tang cannot be that small need to get out more and the next time I get some in I will post a video of them in all their near transparency! True they usually die unless they are placed into a very small reef setup so they can safley grow, hmmm what are the chances?? For my second point, I cannot believe people spent more time arguing over the existence of this system as shown rather than putting that energy into finding us some of those freakin' lights, we know they are real who cares about power usage, really, like we cant get evil66 to solve that for us, really people let's keep talking about if the guy knows Japanese or if Portuguese is an acceptable additional language for another human because that is amazingly relevant to us getting SOME OF THOSE FREAKIN' LIGHTS!!!!! And to close with my third point, I would like to acquire some of those lights. Pretty creative setup. Must be doing something right judging how clean and colorful the tank is. Kindof thinking the same thing... this AINT right. I find it hard to believe that he is getting those colors with those lights. NO WAY!!!! He/she would have to prove me wrong. FAKE!!!!! If you guys click over to his Flickr page, you will see that about a month after I started this thread, there was apparently an "Accident" with the reef. There are three sets of photos on his Flickr. A "Setup" set, a "Before" set, and an "Accident" set. some palys can eat young hippo tangs. this is one of the lamest threads ever...boo to whoever just resurrected it. I'm a threadkiller...I hope it works this time. not unless I BUMP it again. Come on! Really? Who cares? 10 years later im gonna reply for this one 🙂 . this tank inspired me a lot. that push me to find more about the owner . i have tried more than 4 years to get a answer from him. this was his reply . Olá Chatura, muito obrigado pela mensagem. O meu aquário foi desmontando em 2011, e hoje não tenho mais aquário. Nada de substrato, somente rochas vivas. Iluminação: 6 Metal Halides Spot Light, 24W, 10.000K, e alguns Blue LEDs pra enfeitar. Timer para ligar e desligar todo dia automaticamente, com duração de 12H ligado, eu acho. Circulação: Dois Rio 180 com timers, cada um liga e desliga a cada um minuto. Chiller e aquecedor: Temperatura entre 25 e 27 graus. Reposição de água evaporada: Kalkwasser. Repositor automático simples com sensor de nível DIY + garrafa PET + balde + Rio 50, etc. Nada de filtros, skimmers e etc. Troca de água: acho que 7L ou 8L por semana. Acho que usava Sal Tetra Marine Pro. Conclusão, no caso do meu aquário, depois de estabilizado, só era preciso trocar uma parte da água toda semana e o resto ficava largado no automático. Uma vez por mês tinha o trabalho de podar alguns galhos de acroporas que cresciam, pois o aquário era bem pequeno. Hello Chatura, thank you very much for the message. My aquarium was dismantling in 2011, and today I have no aquarium anymore. No substrate, only living rocks. Lighting: 6 Metal Halides Spot Light, 24W, 10,000K, and some Blue LEDs to adorn. Timer to turn on and off every day automatically, lasting 12H connected, I think. Circulation: Two River 180 with timers, each on and off every minute. Chiller and heater: Temperature between 25 and 27 degrees. Replacement of evaporated water: Kalkwasser. Simple automatic repository with DIY level sensor + PET bottle + bucket + Rio 50, etc. No filters, skimmers and so on. Water change: think 7L or 8L per week. I think he used Sal Tetra Marine Pro. Conclusion, in the case of my aquarium, after stabilizing, it was only necessary to change part of the water every week and the rest was left in the automatic. 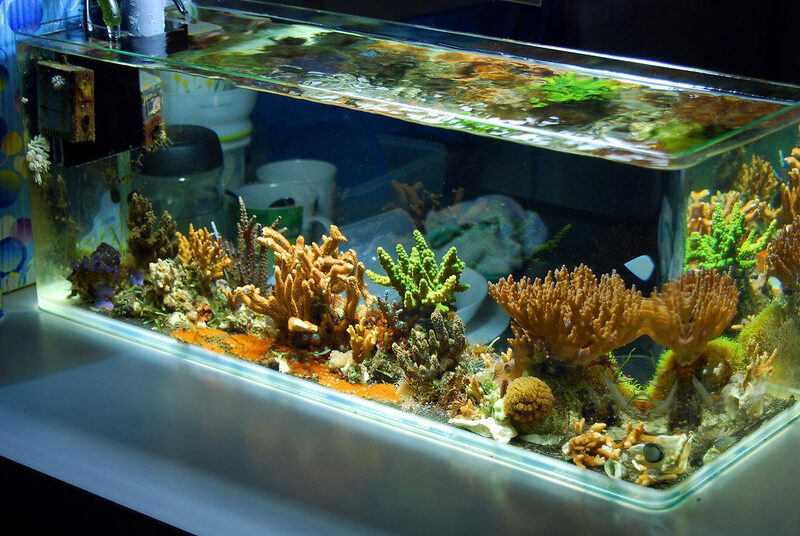 Once a month he had the job of pruning some branches of acropora that grew, because the aquarium was very small. Im professional designer and i know whats possible with photoshop with whats not.this is 100% real reef tank. i feel so sad this tank ddnt won nanoreef.com featured tank.